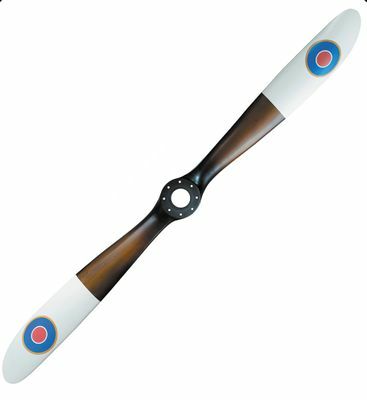 Our large Sopwith Camel Wooden Propeller with Roundels is fantastic airplane decor, and ideal for an aviation themed room, pilot’s man cave, or airplane hangar. It’s large, and being over six feet, makes a powerful impression. To add some historical perspective we also like the use of the insignia roundels on the blade tips. Insignias, like the Sopwith Camel Roundels, began to be used to identify aircraft during WW I. Initially the RAF used the Union Jack Flag, but from the ground it could be confused with the German cross. So roundels became the insignia of choice for the Sopwth Camel fighter aircraft. This Sopwith Camel airplane propeller is crafted from solid mahogany wood. The propeller blades are finished in a handsome distressed medium brown color. The blades are detailed with an attractive contrasting white color, like the top of an airplane wing, which sets off the RAF insignia roundels. Hanging hardware is included. Check out other best selling large Sopwith Camel Propeller with 5-Star customer ratings.